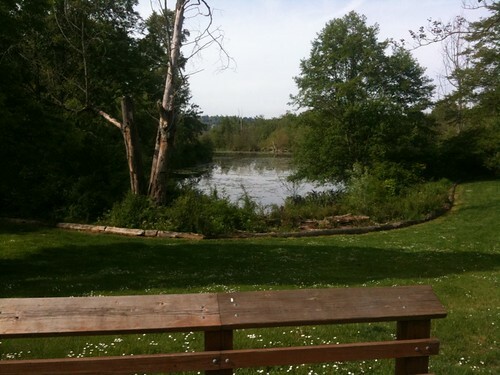 In mid-May, we went to Seattle for the wedding of Eli and Katy. Friday, we went through the usual airline hassles. I assume that this wasn't a splendid example of a cheesesteak, but it was certainly tasty enough to interest me in visiting Philadelphia to try one. In particular, this did much to justify American cheese. The cheese melted very smoothly into a sumptuous goo surrounding the meat; I'm not sure how one would achieve the same effect with a better-reputation cheese - I'd use a bechamel sauce, perhaps. Heavy storms in the Philadelphia airport held up our landing and the departing flight, and lots of connecting flights--so much so that many people didn't make it to the flight to Seattle, and we got to take a row with no one in the third seat. It's been years since I've had such comfort, though I still wasn't able to sleep well. Took a taxi to the guest house, and the established protocols for getting in late at night worked - we entered and made our way up to our rooms without meeting anyone at all. Breakfast at the guest house: yogurt, scrambled eggs with chiles, sausage. I'm faster than a faast monkey. Perhaps you had to experience it for yourself. We were as impressed as always with Pike Place Market, but as always it seems more suited to locals who can refrigerate the produce and vase the flowers. 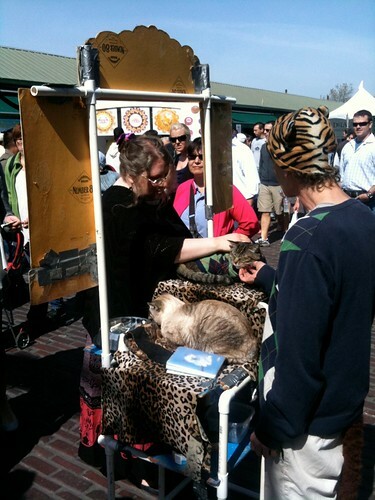 These cats were happy to be petted by anyone, and were absolutely complacent about the crowds. I was amazed. Pike Place Market was also hosting the Seattle Cheese Festival, and we spent a fair bit of time sampling the various cheeses. I particularly liked one cheese that was washed in raspberry ale--but I've forgotten all the details. I've also forgotten the name of the place that makes cheese on premises, though I appreciated the chance to taste samples from every stage of the process. 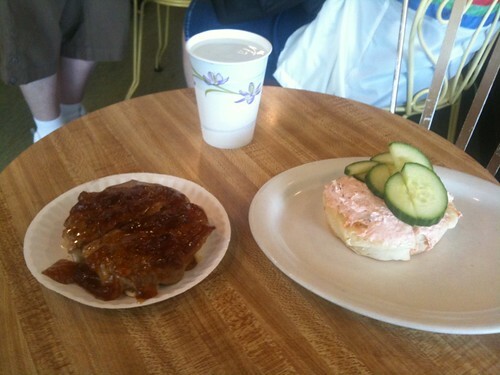 Pike's Place Market has three Roadfood-listed sites, but we only ate at one of them: The Crumpet Shop. I had an impression that crumpets were much like English muffins, but these crumpets were not much like English muffins except in shape; they were very eggy and solid, with much smaller holes. Both our almond-butter-and-apricot jam crumpets and our salmon-cream-cheese-and-cucumber crumpets were good, but not something I'd eagerly seek out again. I was very impressed by the way Dave and Hope treated their kids; they showed them a lot of respect and affection, and were very considerate of their needs and desires. 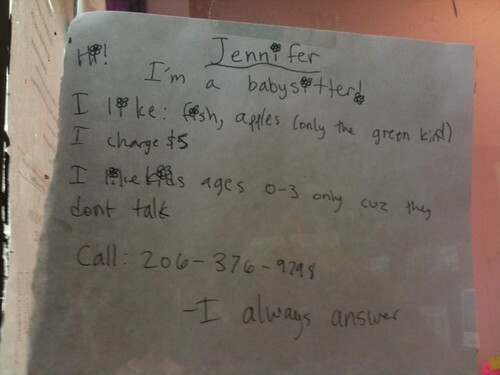 I'll use their example as a role model when we have kids. 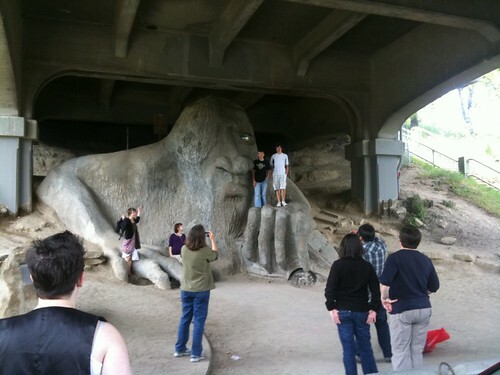 From there, we took a bus up to Fremont to meet up with Sean, Jane, Rachael, and their kids. Fremont is full of art, with lots of interesting buildings and outdoor decor - we met them at the Lenin statue near a planetary intersection. But apparently I'm not yet in the habit of taking pictures of such things, or the people we visit. Oops. We then got to see Jane's show at the gallery, which really was nifty; she's showing these lush super-close-up pictures of flowers, printed on metal that really glows in the light. I don't feel at all wise in such things, but I do like her work. After that, we walked southward, and walked along the canal for a bit. I was impressed by SJR's parenting, also: I really noticed how they set clear but not tight boundaries, and how they made it clear that there were reasons for the boundaries they set. The next stop was Eli and Katy's party for out-of-town guests. (A lovely tradition, which I fully endorse, particularly because it introduced us to people we then talked with at the wedding reception.) This was a pleasant, mellow party. Got up, got dressed up for the wedding, ate breakfast, took the bus up to meet Bruce. This was a special pleasure, because we hadn't been able to make solid plans with him, so it felt like a stroke of luck that it all worked out. 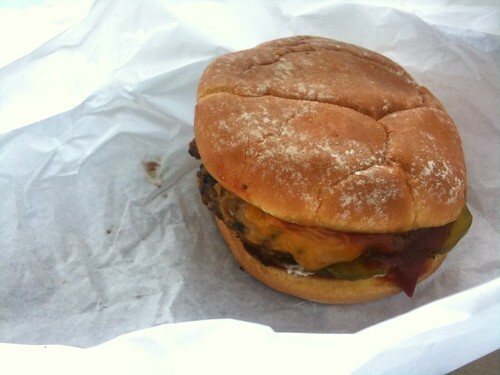 We walked over to Zesto's Burgers, a classic-feeling burger shack that's been in business since 1948. 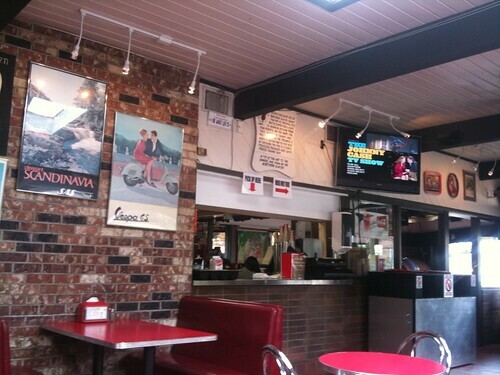 You could imagine the gang from Happy Days sharing a burger here. 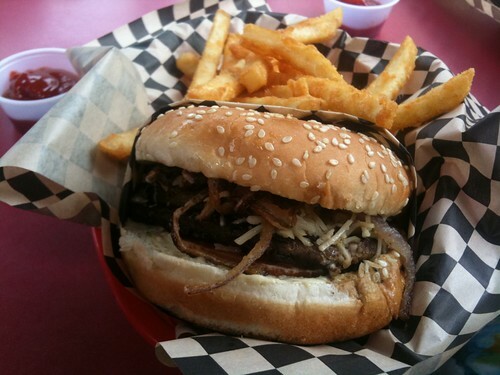 I had the Pacific Burger, "on a fresh toasted sesame seed bun garnished with Zesto's sweet onion spread, smothered with Parmesan Cheese and finished with grilled pineapple and roasted shallots". 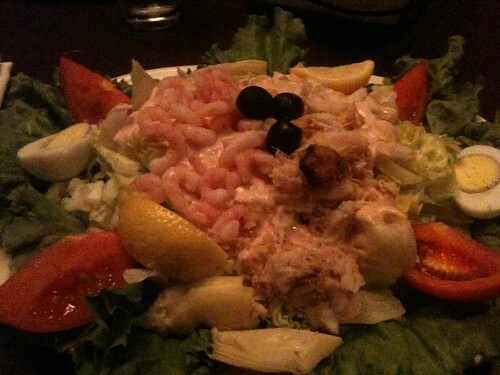 It was very tasty, with a rich savory flavor. We left Bruce's at 12:30 with the expectation that we'd make it to the wedding site comfortably by noon, but the bus we were to transfer to in downtown Seattle didn't arrive in a timely manner (or the bus that brought us there arrived too late). We ended up calling a cab in alarm, and arriving just in the nick of time. We didn't know what to expect from the reception from the invitation, so we made no definite plans. What it turned out to be was tables festooned with pages from page-a-day puzzle calendars, with munchies. We had a good time talking with Vi and Shannon whom we had met the night before, and with Corey Kosak, an old friend from CMU days. There were four flavors: raspberry-lemon, triple chocolate, snickerdoodle, and "Stroop waffle". "Stroop waffle" sent me to Wikipedia. (It turns out that there is a subset of weddings which benefit from being Wikipedia-enhanced, and this wedding is a paragon of that set.) The Stroop waffle cupcake had few waffle qualities, but was filled with a rich caramel syrup. My own favorite of the cupcakes was the snickerdoodle, which exploded with bright cinnamon flavor. 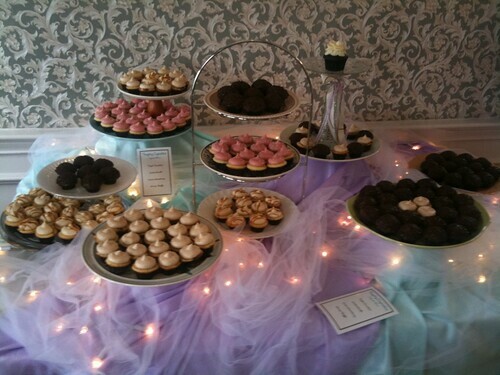 Eli said that the cupcakes came from Trophy Cupcakes, and that Katy had selected them after a lengthy process of sampling all the cupcakes offered by Seattle's numerous bakeries. We laud her selfless dedication to careful research. The reception wound down in late afternoon, leaving us without plans. We started to bus back to the guest house. 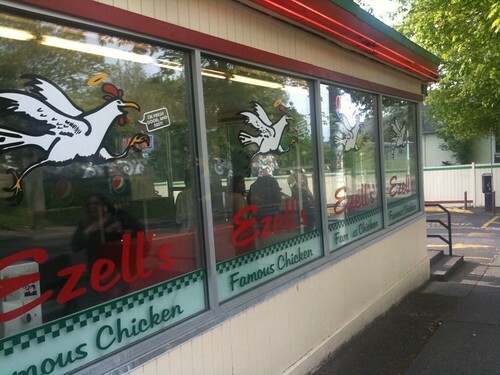 Midway through the ride, I noticed Ezell's Famous Chicken, and said "Hey, that's Roadfood-listed!" I'm glad that we had all-day bus passes; I might have thought twice about getting off the bus otherwise. We were both far from hungry from the bounty of the reception, so we got only a two-piece box with a roll. Unfortunately, I observed no sterling qualities of the chicken; to me, it could have been any other half-decent chicken. 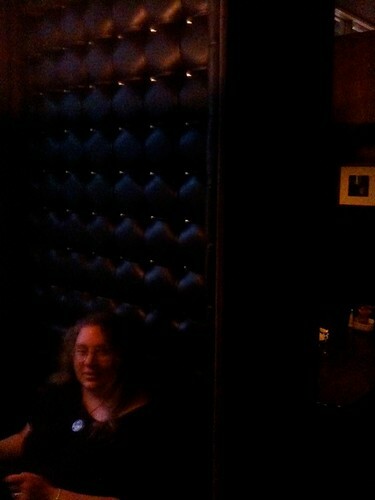 (The low light taxes the iPhone camera). This was excellent, with a very lively taste that really suited my mood just then. 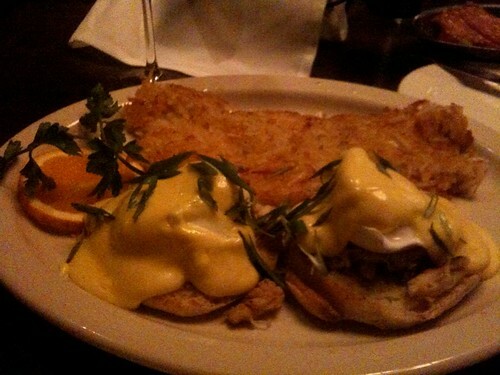 Lori had the eggs Benedict. I have few memories of them after two weeks, but I think they were good. Another bus ride, and another longish walk to our last Roadfood destination of the night, Cupcake Royale. 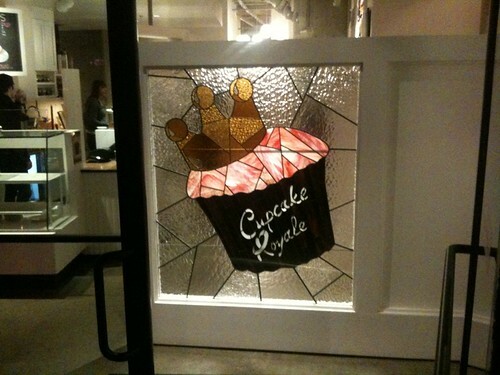 Cupcake Royale had an arty, spare decor that made me feel that I was clearly not as cool as the restaurant. They weren't mean or anything, they just were clearly the cool kids, with far more piercings and tattoos than I would want if I wanted piercings and tattoos. 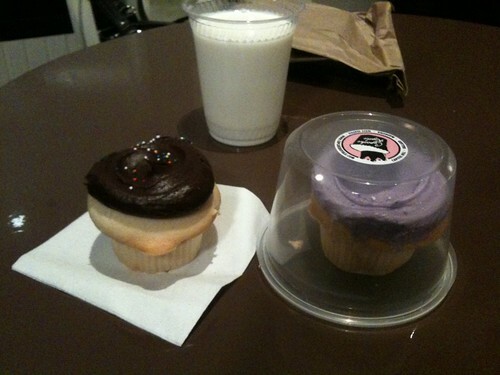 Lori ended up packing the lavender cupcake into her carryon and enthusiastically calling it her "emergency cupcake". Several blocks back to the guest house, and our legs were aching badly by this point. Woke up, legs still aching. In the interests of time and reliability, we took a cab instead of a bus to our last Roadfood-listed destination, Hi-Spot Cafe. This was excellent, probably the best restaurant that we ate at just the two of us. 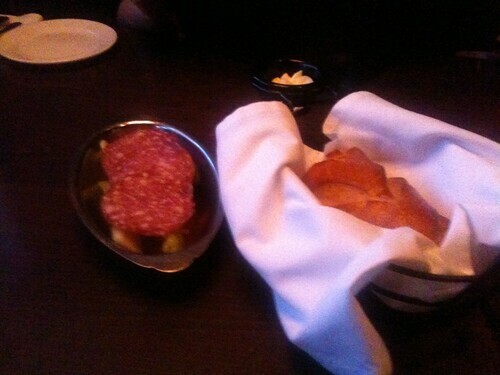 We substituted fancy breads for the default breads that came with our entrees. 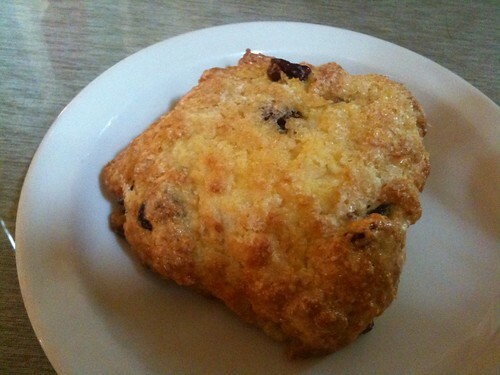 Lori got a cranberry-orange scone, and I got a mammoth cinnamon roll. 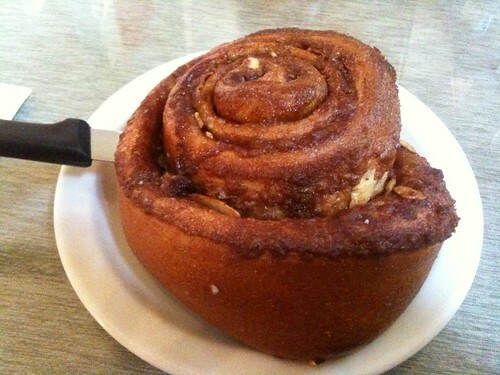 It was a really excellent cinnamon roll, full of gooey cinnamony goodness without being Cinnabon-cloying. 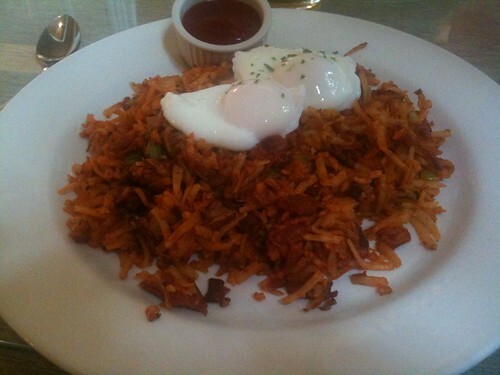 I got the spicy corned beef hash, which was quite good (and clearly used better corned beef than I get at my usual hash stop in Pittsburgh), but was too spicy for my ideal of corned beef hash. It was clearly just what its creator wanted it to be, but I probably wouldn't order it again. 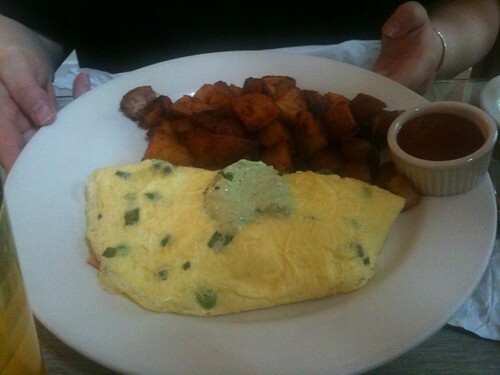 Lori got the El Pacifico Omelet, with "Smoked Salmon, Capers, Scallions, and Dill Cream". This was really excellent, with a flavor that filled the mouth without overflowing. I would love to have this again. 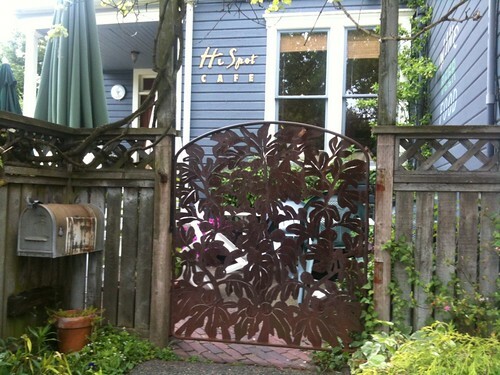 The Hi-Spot Cafe is a charming place, too, with winsome decor and a very pleasant atmosphere. Sigh. I feel I've written a very pedestrian report of a really splendid time.